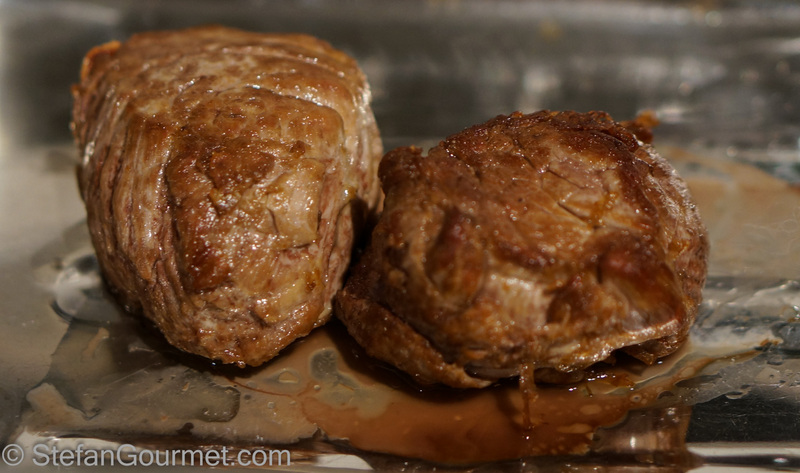 I’m calling this recipe “swine” tenderloin as I made it with wild boar tenderloin, but it can also be made with regular pork tenderloin. 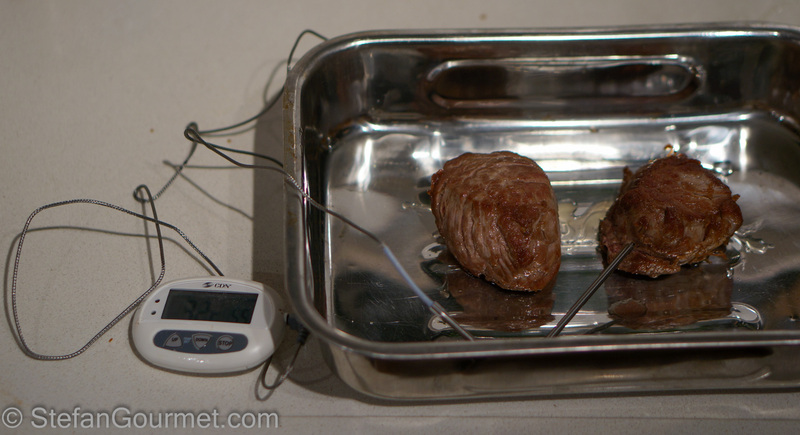 For a change I’m not cooking it sous-vide, instead I finish cooking the meat in the oven after searing, using a digital meat thermometer with a probe and a low oven temperature to make sure that the meat is perfectly medium rare. 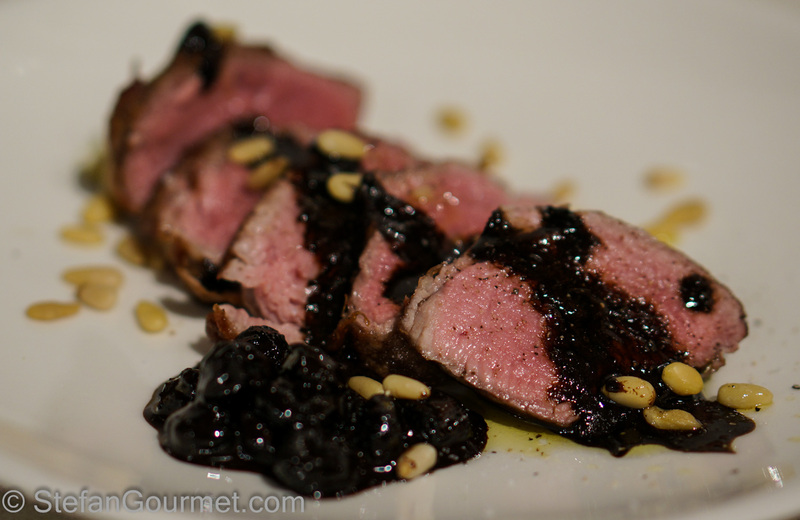 The sauce is a balsamic reduction with raisins and pine kernels, using the browned bits in the pan from searing the meat for added flavor. 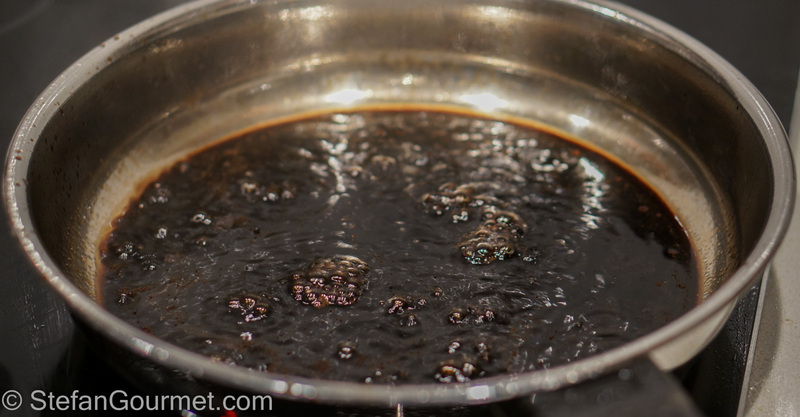 For the balsamic reduction it is very important that you use a balsamic vinegar that does not have caramel as a coloring agent. Its only ingredients should be grape most and wine vinegar. (Only grape most is also fine, but using such high quality aceto balsamico tradizionale would be a bit of a waste for this.) 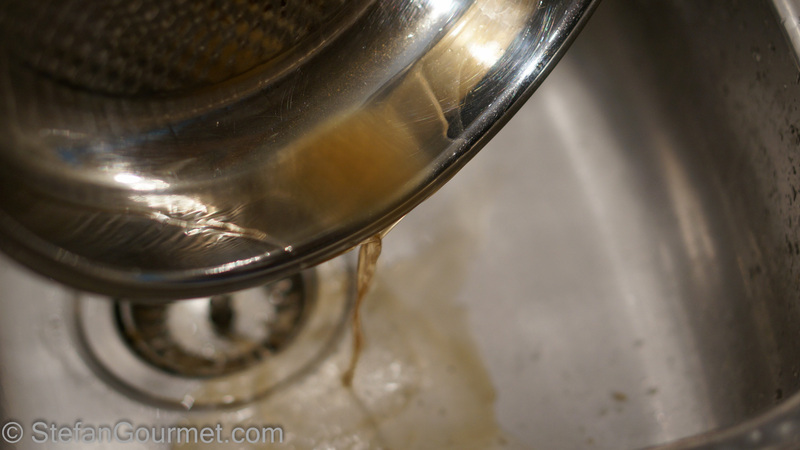 This is because the caramel will give the balsamic reduction a bitter flavor. 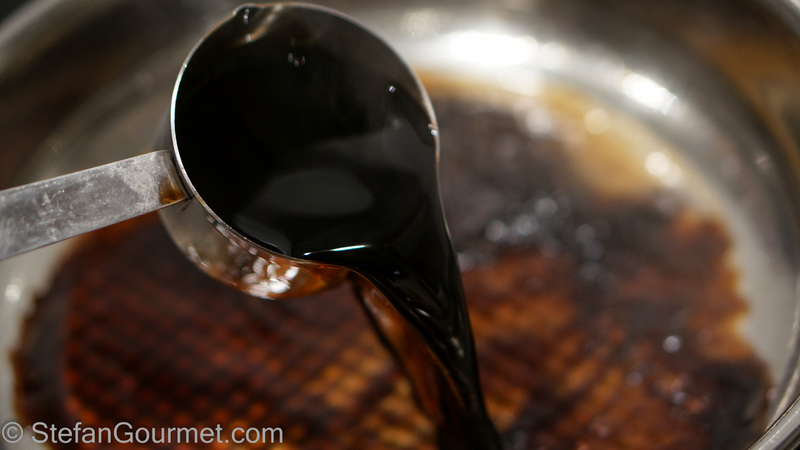 Caramel is already burned sugar, and so when you reduce it the burned taste becomes too strong. On the picture you can see that the meat is perfectly pink all the way to the edge. 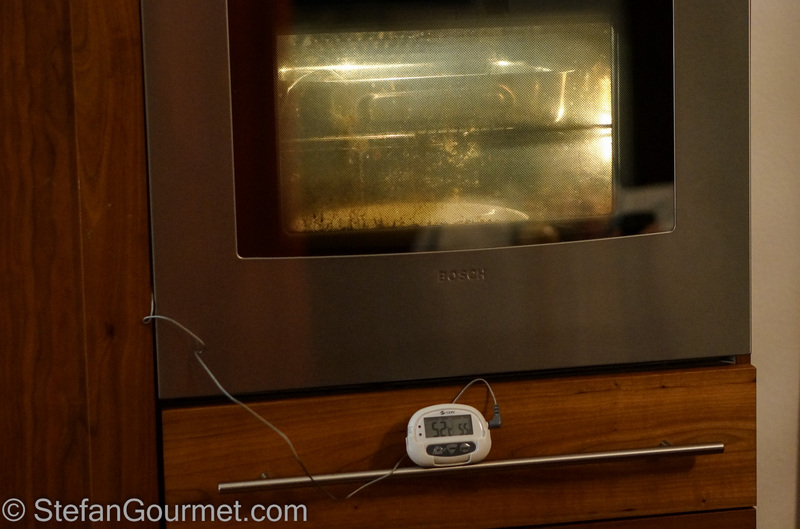 That is not only possible with sous-vide, but also with a low oven. In a 100ºC/210ºF oven it takes about 45 minutes to finish cooking the meat this way, but there is no resting time needed so you will save time that way. If you are in a hurry you could cook the meat in a hotter oven in 10-15 minutes, but then you’d need to let it rest for at least 10 minutes and the meat will end up with a ‘doneness gradient’, meaning that the outside layer will be overcooked and only the center will be perfect. Preheat the oven to 100ºC/210ºF. Pat the pork dry with paper towels and season with salt and freshly ground black pepper on all sides. 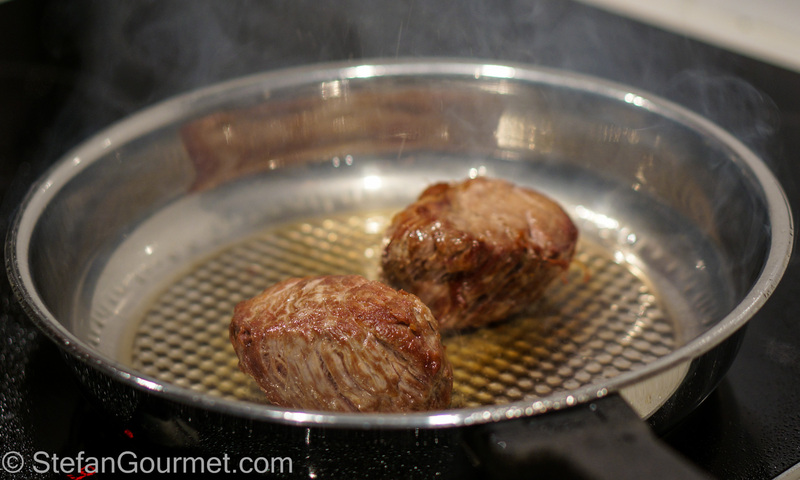 Heat the olive oil in a frying pan over high heat and brown the pork quickly on all sides. Put the pork in an oven-proof dish. Insert the probe of a digital meat thermometer into one of the pieces of pork such that the tip of the probe is in the center of the meat. Put the dish with the pork in the oven at 100ºF/210ºF and keep it there until the thermometer reads 55ºC/131ºF for medium rare or 60ºC/140ºF for medium. Put the plates in the oven as well in order to preheat them. Meanwhile, prepare the sauce. 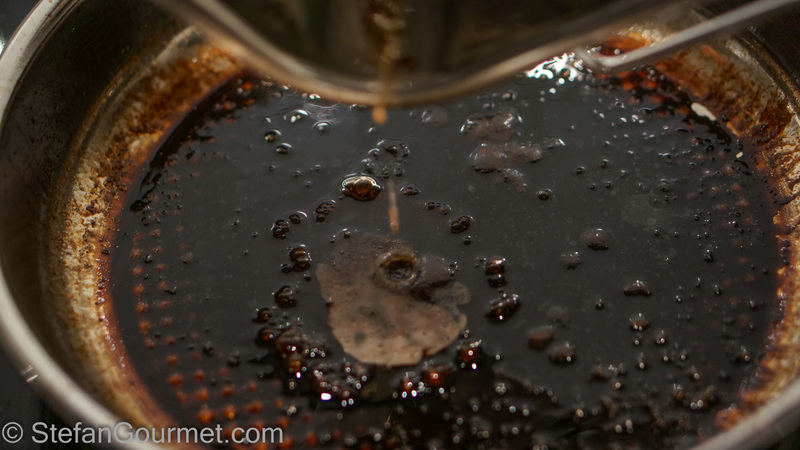 Start by discarding the oil from the pan. Deglaze the pan with the water or white wine, scraping with a wooden spatula to include all the browned bits left from searing the pork. 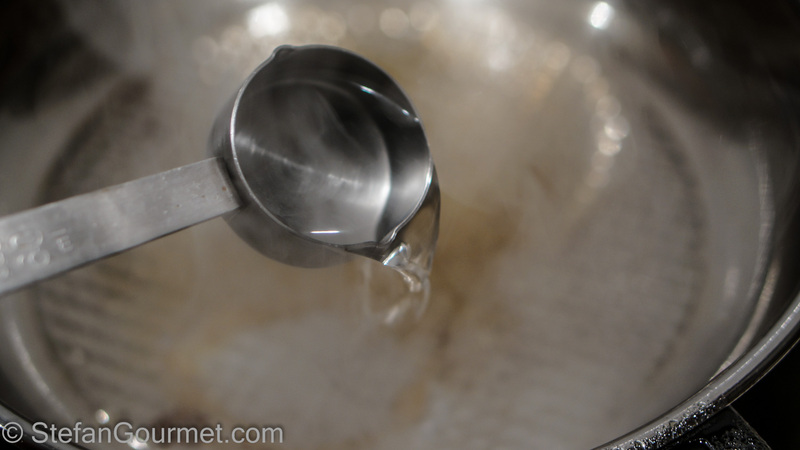 Simmer until thick and syrupy over low heat. 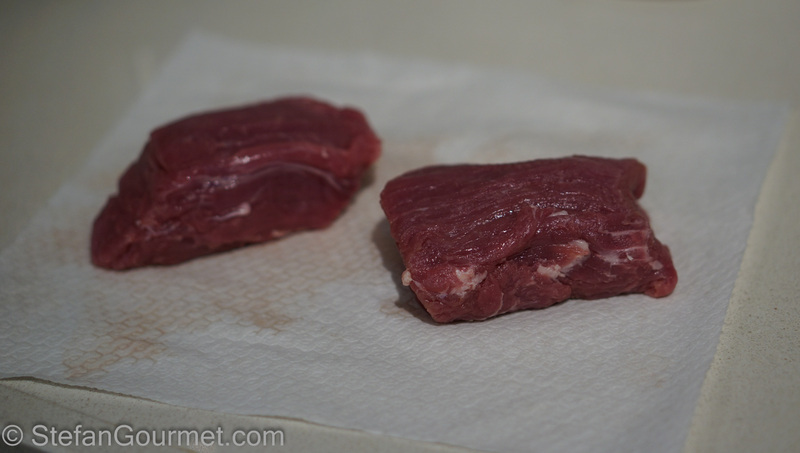 The meat is done when the center has reached 55ºC/131ºF. 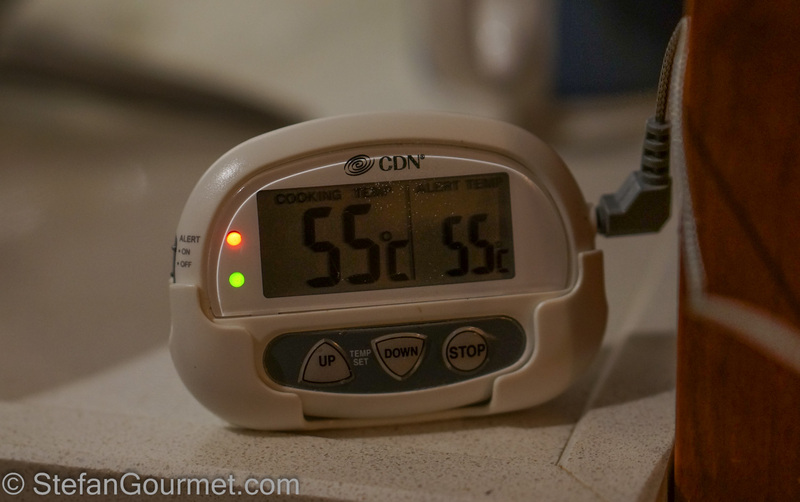 A digital thermometer with a target temperature is very handy as the alarm will go off when the meat is done. The meat will have leaked some juices. Add those juices to the sauce, as we want to include as much flavor as possible. Add the raisins to the sauce. Slice the pork, arrange it on the preheated plates. Spoon over the sauce with the raisins. Garnish with the pine kernels. This Italian take on fish soup is a great way to prepare a mix of fish and other seafood. The heads and bones of the dish are used to make the stock. 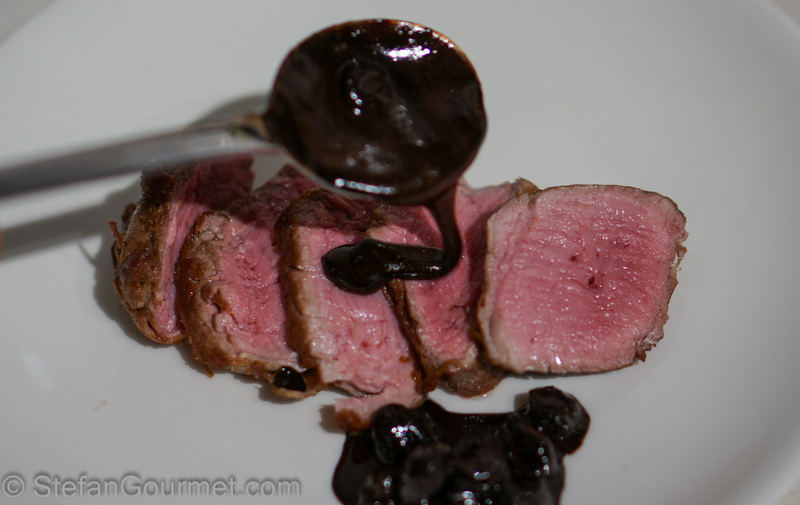 I’d make this recipe just for the balsamic reduction alone. Stefan, this looks fantastic. Swine is only available at specialty stores here in SF, so I will look for it there; otherwise I will make it using pork tenderloin. vedo che sei organizzatissimo; hai anche il termometro per misurare la temperatura della carne. Fantastico! Piatto dall’aspetto eccellente e sicuramente anche il sapore. 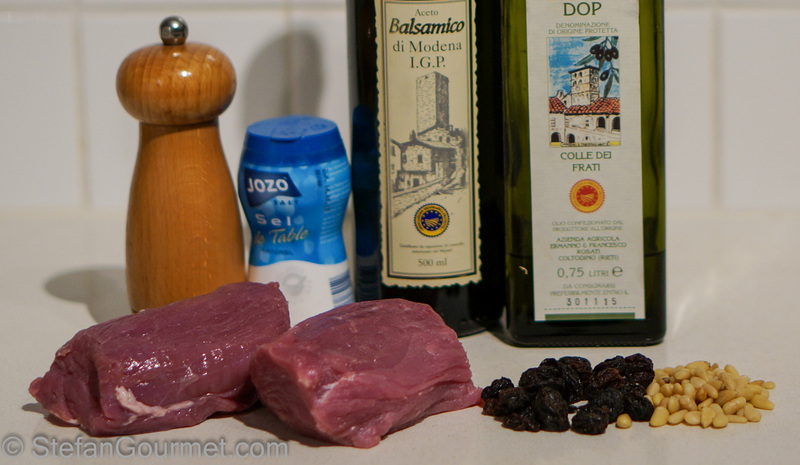 Another bit of education on the balsamic front. Thanks for that. The method is excellent and the sauce looks top notch. I found this out the hard way! 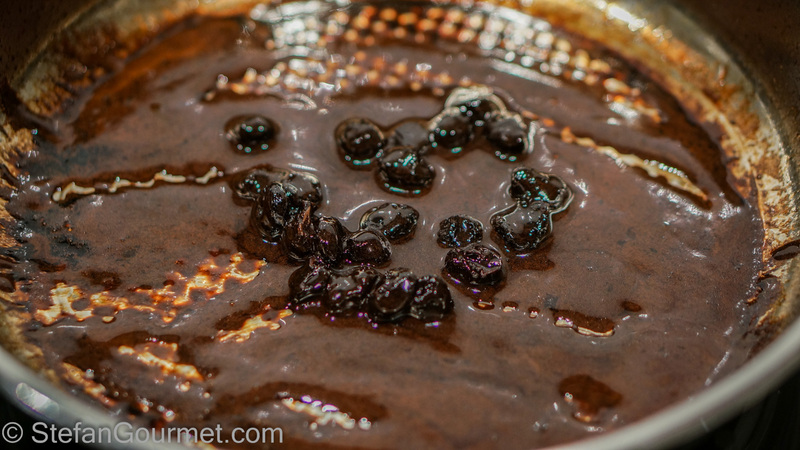 Traditional balsamic vinegar is made of 100% grape most and gets the dark color naturally. In the cheaper versions part of the grape most is replaced with wine vinegar, and caramel added to make it look like the real thing. Fine for use in salads, but less for strawberries and, as I found out the hard way, not at all for reductions. That’s a beautifully cooked piece of meat, Stefan, and its presentation is among the best you’ve accomplished. 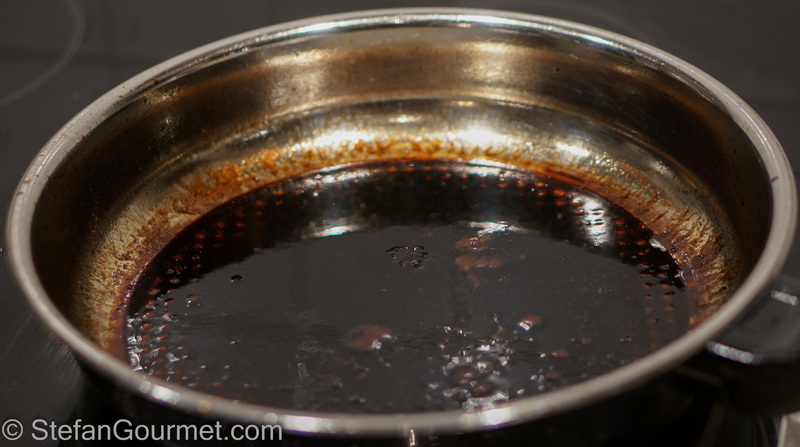 And that balsamic reduction is so thick and rich looking. Well done!